Satoshi, Shion and Satoko. . Wallpaper and background images in the Higurashi no Naku Koro ni club tagged: higurashi higurashi no naku koro ni satoko shion satoshi satoko houjo satoshi houjo shion sonozaki. Awww! I love Higurashi and this image! 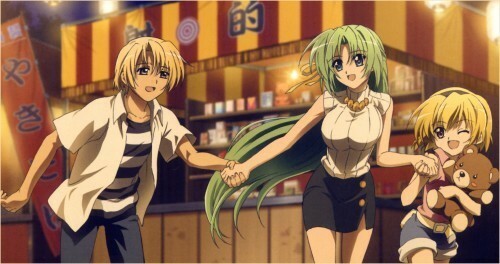 Shion is getting along with Satoko and Satoshi!!! They look like one big happy family! Shion Satoshi and Satoko are all smiling in the same picture. It's the sign of the Apocalypse!